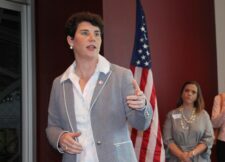 Roll Call – Democrat Amy McGrath announced Monday that her campaign raised $3.65 million in the third quarter for her bid against GOP Rep. Andy Barr in Kentucky’s 6th District. The $3.65 million haul came from more than 32,000 donations, according to the campaign, which said it has raised $6.65 million since it began in August last year. McGrath finished the third quarter, which ended on Sept. 30, with $1.7 million in the bank.